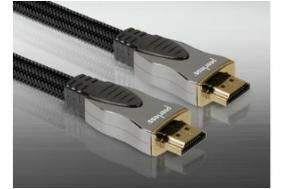 Peerless launches three new ranges of HDMI 1.4 cables | What Hi-Fi? Divided in to four tiers – ultimate, best, better and good – three of the four cables conform to the latest HDMI standard for optimum 3D viewing and offering high-speed with Ethernet. The top-of-the-range Omega cable is designed for 'ultimate' performance, with a solid brass head-shell, black mirror finish and chrome inlay and 24k ‘hard' gold cable contacts. It boasts oversized silver plated PCOFC copper conductors, which claim to provide the digital signal with more headroom. Omega is available in 1 and 2 metre lengths, at £129.99 and £149.99. Sigma (pictured) is billed as a more affordable high-end solution, with HDMI, stereo RCA, digital coaxial, digital optical and Scart cables offered. The Sigma HDMI costs £69.99 for 1 metre and £89.99 for 2 metre lengths. Next there's an ultra-thin, 2 metre Slimline intended for connecting to wall-mounted super-slim TVs. It has a 90 degree connector at one end that only projects 14mm from the rear of the screen once fitted. Boasting a low profile of just 3mm flat, the cable is also HDMI 1.4 and high-speed with Ethernet, and costs £59.99. The Delta series is available in 1, 2 and 5 metre lengths across nine different cable options, including HDMI (also available in 3 metre lengths), component, Scart, digital coaxial and digital optical – 17 product options in total. The HDMI option costs £40 for 1 metre and £50 for a 2 metre length. Lastly, Alpha aims to be the ideal ‘first upgrade' cable, hoping to represent a significant improvement from cabling generally supplied with AV equipment.It's the only one in the range that isn't HDMI 1.4, being instead an HDMI 1.3b cable. There are 25 cable options in total, including HDMI, component, Scart, digital coaxial and digital optical, at 1, 2 and 5 metre lengths. All cables are double-shielded with OFC copper conductors. We'll have a review of a Peerless HDMI cable in the July issue of the magazine.